The CastAway-CTD is widely-used as a tool in environmental science classes as a way to help instructors teach water property fundamentals and demonstrate methods to collect data. 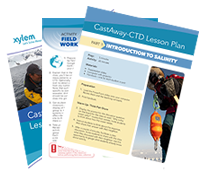 Now, CastAway-CTD customers and educators have access to a customized lesson plan developed in partnership with the Scripps Institution of Oceanography, focusing on salinity measurements. Have your instrument serial number handy? Please complete this form to download the complete curriculum.